For state cases, the Bluebook rule (generally) is to cite to the West regional reporter. See the graphic below for the proper settings. 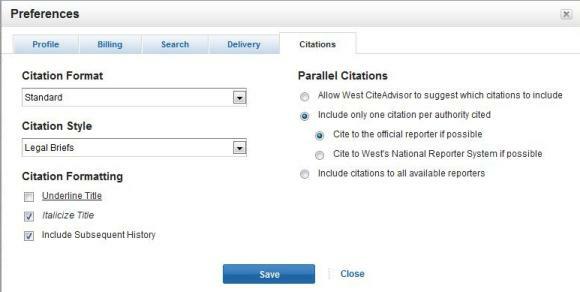 If you check the “Allow West Cite Advisor to suggest which citations to include” you will get parallel citations. For the Bluebook set the citation format to standard. The citation may need some editing once you paste it into Word, but this feature gets you at least part of the way there. ﻿For federal cases, set your settings as depicted in the graphic below. Note that the big difference is that you check “cite to the official reporter if possible.” You should always check the citation, especially for abbreviations for case names (check table T6 in the Bluebook), but using this feature will get you part of the way there.